Panther Hollow hillside. Do pawpaws live here? This blogger has it bad. Pawpaw fever, that is. The old scout song makes gathering pawpaws sound so easy. Pickin’ up pawpaws, put ’em in your basket…way down yonder in the pawpaw patch. Nothing to it, right? Just head down to the ol’ pawpaw patch–the damn things must be everywhere. Yeah? Well, it’s not quite that simple. It started so innocently, almost a year ago. A chance encounter with Andrew Moore, the pawpaw expert who literally wrote the book on “America’s forgotten fruit”. In that conversation, I learned that I had just missed the 2015 season, which was frustrating, but certainly something to look forward to. That pawpaw trees (and their fruit) grow wild and plentiful in our region only made the pursuit more enticing. 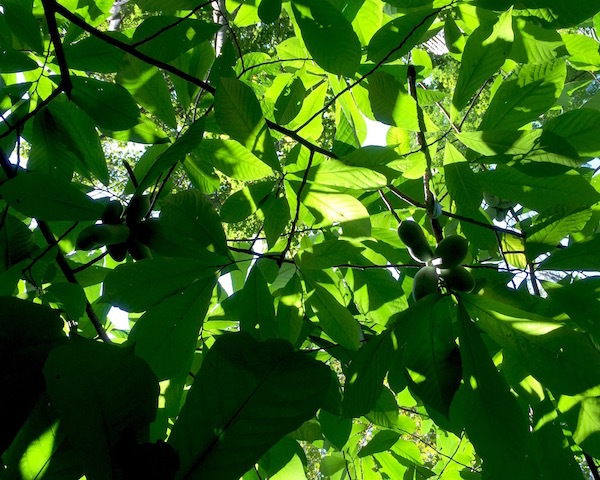 Could The Orbit locate publicly-accessible fruiting pawpaw trees right in the city? We set our sights on finding out. So I waited. Eleven long months counting down to pawpaw season. I read Moore’s book, which only intensified desire. Pawpaws are among our oldest heritage foods–eaten by natives, colonists, and western explorers. The trees grow wild through a wide swath of the eastern half of the United States, but they’re amazingly foreign to most Americans. The fruit is loaded with vitamins and minerals and is credited with treating diseases from gonorrhea to cancer. And, of course, it’s supposed to be delicious. The flavor is most often compared to something between banana and papaya, often with “caramel notes”, and a pleasing custard-like texture. Hungry yet? Yeah, me too–and you haven’t been waiting a year to get a taste! 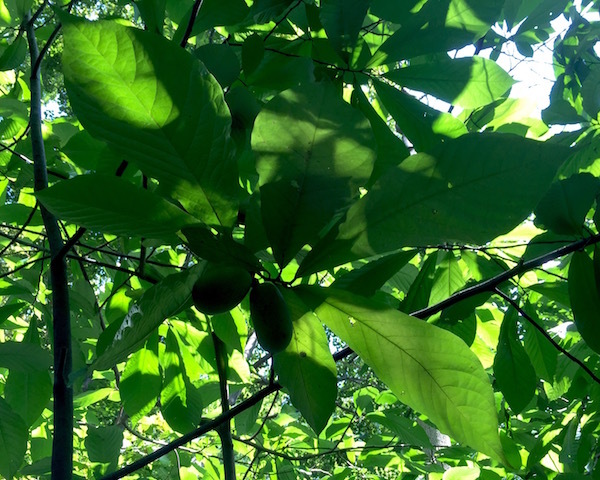 Friends, neighbors, The Internet were all polled: Do you know any pawpaw patches in Pittsburgh? People tried to help, but like marrying a prince, or profiling serial killers, one has to sift through a lot of bunko anonymous tips to kiss the right frog. No pawpaws here. Pawpaw Way, Hazelwood. Another spoke to rumored pawpaws by the Stanton Heights community garden. 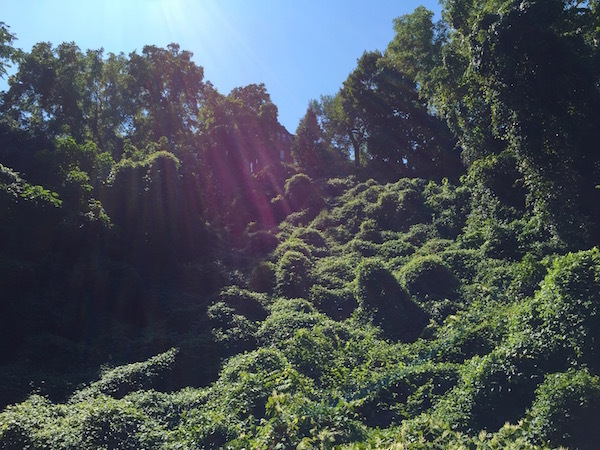 I climbed most of that big hill in a low gear, traipsed through the woods, and talked to an Allegheny Cemetery groundskeeper and some Saturday morning gardeners. Sadly, no one knew anything about pawpaws…or at least, no one’s talking. 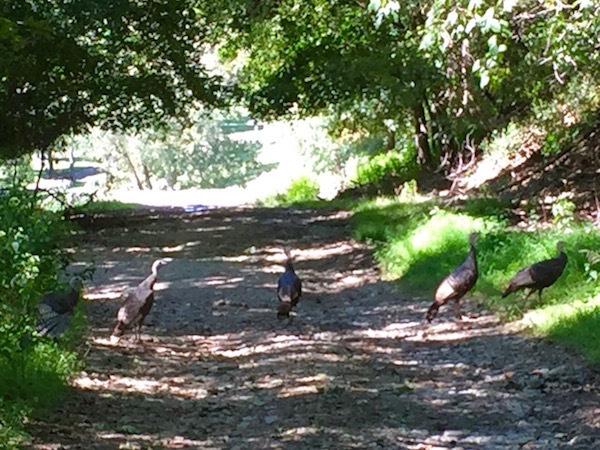 We did happen to cross paths with a rafter of wild turkeys, which seems like a decent trade-off. A third offered pawpaws along the North Side bicycle trail, just as you get off the ramp to the Washington’s Landing bicycle/pedestrian bridge, but it wasn’t happening. There were even more vague directions for entire neighborhoods: “South Side Slopes” and “Panther Hollow” and “on the hill behind Phipps (Conservatory)” and “Frick Park, along the trails”. It’s no surprise that none of these panned-out, but people have got to be a little more specific–we’re racing against time here! Little Pawpaw Way in Hazelwood is six kinds of overgrown, but not with its namesake tree, which is nowhere to be found. So, empathetic readers will undoubtably understand what a thrill it was to finally lay eyes on the big, tropical leaves of the first pawpaw trees we actually found. There, just feet from a trail in Schenley Park, were tall, mature, big-leafed trees–much larger than I’d expected, but unmistakable after so much preparation. A scurried hustle off the path and down into the fabled pawpaw patch. Trees–from tiny infants to mature thick-trunked giants–in every direction and continuing far back into the wood. It is glorious, cool in the near full tree cover, soothing, airy, and private. Seeing no fruit, we began to shake the trees small enough to wrap a hand around. Ripe pawpaw fruit should fall from a shaken tree, but none did. We continued on, deeper into the understory. And then, there they were: a pair of oblong, fist-sized, and potato-shaped green fruits joined under a leaf section. Looking around, another cluster, and then another. Some of the pawpaws low enough to touch, others many feet out of reach. We were finally, unequivocally, in the right place…or were we? Will our blogger ever achieve sweet relief beneath the leaves? Does the peculiar pawpaw please the palate or merely maim the maw? And With fruit in hand, what’s the plan, man? I’m afraid, dear reader, this blog post must end on the kind of nail-biting cliffhanger one would expect, nay, demand from a story about foraged fruit. We get to all that, however, in Part 2 of On the Trail of the Wild Pawpaw. Andrew Moore, Pawpaw: In Search of America’s Forgotten Fruit (Chelsea Green Publishing). More of Moore in Part 2. Pawpaw fruit is ripe enough to pick roughly for the month of September in western Pennsylvania’s climate zone. Yes, rafter is the term of venery for turkeys. It is around this time of year that the intrepid city climber has usually packed-away his or her step-hiking boots and can but merely dream of a fast-forward to warmer temperatures, de-iced stair treads, and the re-greening of hillsides. But this particular season’s relentless run of glorious late fall weather has kept the traditionally cold, gray, and wet days at bay. There’s been nary a snow flurry, freezing rain, or frosty morn to even hint at the inevitable winter days to come. The bewildering number of perfectly blue sky days is something rarely seen around these parts. And so it was this past weekend. 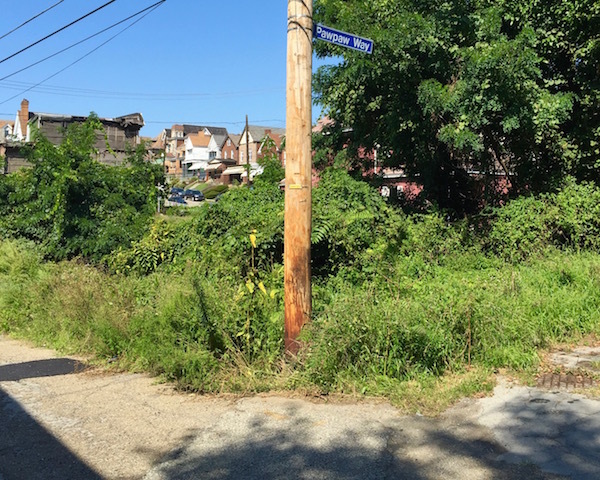 We seized the opportunity to embark on an up-and-down* bicycle-based reconnaissance of the Greenfield and Hazelwood neighborhoods which led us to a happenstance trip up Tullymet Street, a most excellent set of city steps heretofore unexplored by this blogger. Steps as far as the eye can see. The longer stretch of the Tullymet steps, from Sylvan Ave. up to Gladstone St.
Hazelwood’s long, curving riverfront was once home to the enormous Jones & Laughlin steel mill and it is one of the many city neighborhoods that used to primarily house the industry’s huge local workforce. Like a number of its peers, there is no longer that much to walk down to anymore–the mill is gone, as is most of the commercial activity on Second Avenue. Unlike those other neighborhoods–say, Troy Hill or Fineview or The West End–there’s also not that much to walk from up the hill. Gladstone and Sylvan are quite long streets that clearly used to contain many homes, (you can see this both in old city platte maps and evidence from the extant foundations that remain) but are now almost completely vacant. Today, there might be just one house every hundred yards up here–and half of those appear uninhabited. Nature without man. Foundations of felled houses, seen from the Tullymet Street steps. It’s a curious thing, as I could imagine it being quite a terrific place to live. The location is right there in the city (it’s probably three miles to downtown, as the crow flies), just around the corner from bustling Squirrel Hill, and an easy ride to Oakland. These particular streets are completely surrounded by nature, spectacularly quiet, and with lovely views all the way across the river–at least by this time of year, when the leaves have all fallen to clear the sight lines. Oh, sure–it’s probably hard to get a pizza delivered up here and I imagine you’d get snowed-in pretty easily being the only one left on a half-mile dead-end street, but people pay top dollar for that kind of isolation in other places. Imagine the possibilities! Whether or not you’d consider moving in, it’s well worth an afternoon visit–especially if you get another it-ain’t-winter-yet day like this one. Tullymet’s two sets of steps probably contain 250-300 actual stairs (I didn’t count), so it’s a good run any way you cut it. But numbers aside, I can’t stress enough how fantastic it was to be right there, on the edge of the center of the city, in eyeshot of the Monongahela River, in absolute tranquility; the only sounds the chirping of birds and the rustling of fallen leaves. And I realized what a mistake it was to consider the post-fall colors period to be down time for a step hike. What’s left of Pittsburgh’s lush spring/summer viney overgrowth, denuded in the cold weather months, creates an eerie, otherworldly science-fiction landscape when struck against the impossibly bright blue sky and low winter sun. How fortunate are we to have these magical landscapes right here, open all year ’round. * “Up and down” is no joke. This blogger’s fancy phone informed him that he climbed the equivalent of 131 flights of steps over the course of Saturday–this is roughly a hundred flights more than the average day.